4 New nuclear power plants? The Swiss village Benken is located just a few kilometres from the Rhine Falls close to the border between Germany and Switzerland. From the point of view of the NAGRA (National Cooperative for the Disposal of Radioactive Waste), Benken is one of the preferred locations for a final repository for the high-level radioactive waste produced by the five nuclear power plants in Switzerland. Besides Benken in the Zürcher Weinland, the regions of Bözberg and North Lägeren are candidates in the actual process of site selection for the high-level radioactive waste (HLW) repository. All three sites offer opalinus clay as host rock. For so-called low- and intermediate-level radioactive waste (L/ILW) the NAGRA considers Südranden, Jura-Südfuss and Wellenberg with the host rocks opalinus clay, Effingen beds, brown Jurassic rock and marl formations of the Helveticum, as well as the already mentioned regions considered for high-radioactive waste. The NAGRA considers a possible combination of a nuclear disposal repository for high-level as well as low- and intermediate-level radioactive waste, for example in Benken. The Sectoral Plan process takes place in three stages and ends with the selection of one siting region for the high-level waste repository as well as one for the low- and intermediate-level radioactive waste repository or a combination of both in one nuclear repository. At the end of the Sectoral Plan process – estimated in the year 2017 – a referendum about the General License Application for a deep geological repository will be held. 2001 The interim storage facility for radioactive waste in Würenlingen (Canton Aargau) goes into service. Dec. 2002 Submission of the „Demonstration of disposal feasibility“ (based on Opalinus Clay) study for high-level waste to the Federal Council. 2005 The Nuclear Energy Act and Ordinance is enacted. Since mid 2006, spent fuel elements cannot be exported abroad any longer. Nuclear waste must be disposed within the country's boundaries in principle. 2006 The Federal Council approves the „Demonstration of disposal feasibility" project, but requests for the evaluation of multiple siting regions. 2006 The General License Application for a deep geological repository is set up. 2008 The Federal Council approves the conceptual part of the sectoral plan for deep geological repositories. 20/09/2008 Around 2,000 people demonstrate against the planned nuclear disposal repository in Benken. Nov. 2008 Announcement of the proposed siting regions for deep geological repositories by the Federal Office of Energy (SFOE). 2008-'16/'18 Sectoral Plan process in three stages. 2016/'19 Federal Council decides on General License for deep geological repositories, followed by the approval by the Parliament. Possibility of a referendum. 2019/'23 Construction license for underground laboratories at the siting regions. from 2030 Start of operation of a final repository for low- and intermediate-level radioactive waste. from 2040 Start of operation of a disposal repository for high-level radioactive waste. Due to their ongoing uplift the alps are not suitable for a nuclear repository. Therefore, the original concept of the NAGRA was a final repository in deep granite layers covered by sediments as a second safety barrier. But despite a cost-intensive search no suitable granite formation was found in Switzerland. Hence, the NAGRA brought up another host rock for the ideal nuclear repository. The sedimentary rock Opalinus Clay, a clay rock of the Middle Jurassic. Especially its self- sealing effect is praised by the NAGRA. Heat Generation: With the expected heat development of the stored fuel elements, critics refer to an associated drainage and loss of the plasticity of the surrounding soil. Thin layer of Opalinus Clay: Below Benken, there is only a thin layer of Opalinus Clay of about 105 to 125 m located at a depth of 400 to 600 m, which should take up the high level nuclear waste. The alternative locations North Lägeren and Bözberg are similar to Benken and also provide only thin layers of Opalinus Clay. Seismic Area: The last moderate earthquake with a magnitude of 5.4 (on the Richter scale) in December 2004 reminded the people at the border triangle once more that the Upper Rhine Rift is a seismic zone, in which even worse earthquakes are possible at any time. 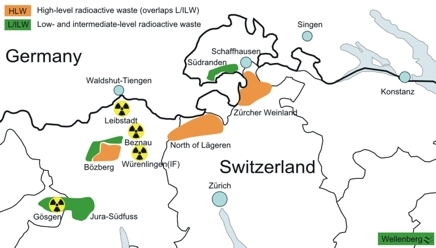 European Drinking Watershed: A leaky nuclear disposal repository would not only endanger people on the High-Rhine and in the Lake Constance region. The direct proximity of Benken to the Rhine and the Rhine Falls means that the source of drinking water for millions of Europeans along the Rhine in Switzerland, Germany, France, Belgium and the Netherlands would be endangered in case of a disaster. In 2008 the electric power companies Atel, Axpo and the BKW FMB Energie AG submitted General License Applications for three new nuclear power plants to the Federal Office of Energy (FOE). If the General License Applications are approved (as might be expected) by the Swiss Federal Council (Bundesrat) after an extensive procedure lasting approximately 4 years, the alliance „Stop Atom“ will seize a referendum for or against new nuclear power plants. This page was last modified on 1 November 2013, at 14:23.